When will it get anthologised? And do you plan further graphic novels? Ahh, classic Reynolds. A shame he never really bettered this early masterpiece. I actually held this precious tome when Alastair had a meet-the-author night in Pontardawe Library. Oh man - I admire your courage, sir. Putting up something like this speaks to a self-confidence I am only dreaming of! 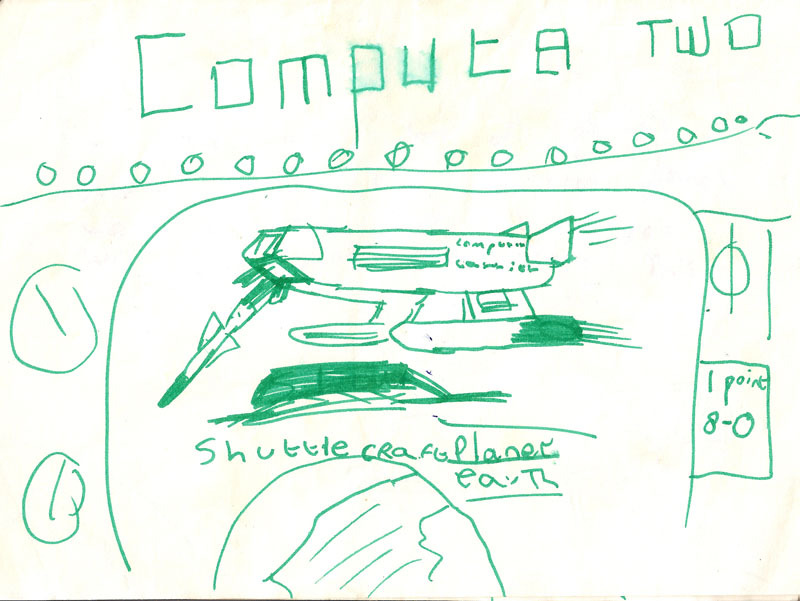 The Star Trek Shuttle craft features prominently in my early work as well. I cannot read it well, because the handwriting isnt too clear. Can you set it in typed letters here, please? Daran: yes, Star Trek shuttlecraft influence is very clear there, isn't it? I think the computer is from The Goodies (early 70s UK surreal comedy show, sort of like Monty Python for kids). 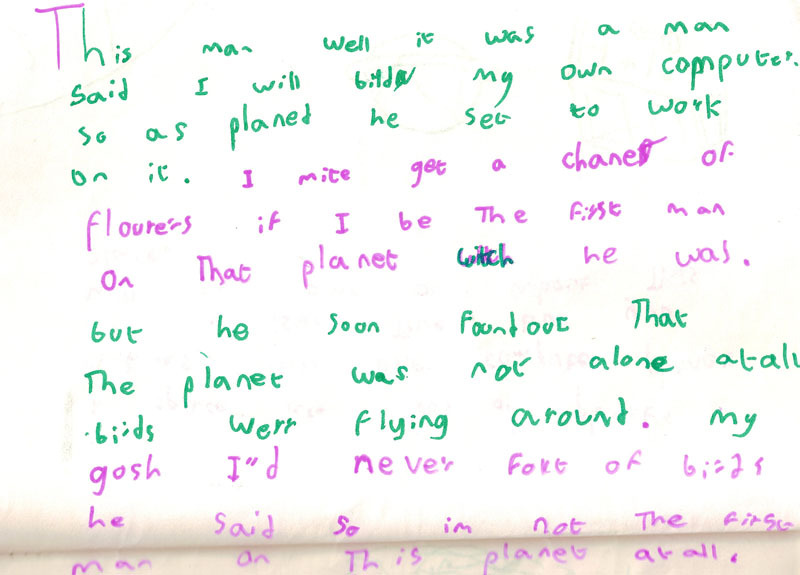 Aurora: if I get the chance I'll try to transcribe it. Away from home at the moment. Will post the thrilling conclusion when I return. Aurora: I'll give it a shot, if you don't mind. Mr. Reynolds, feel free to correct or delete my translation when you get a better one going! *note* I attempted to correct spelling for ease of reading. Words in brackets are those I am very unsure of. 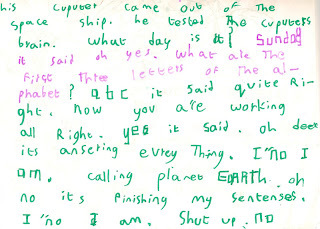 Words in capitals are the computer speaking. 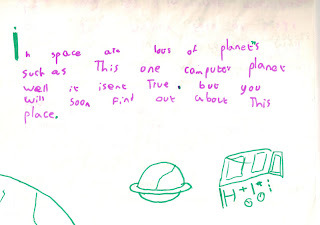 In space there are lots of planets, such as this one computer planet. Well, it isn’t true. But you will soon find out about this place. His computer came out of the spaceship. He tested the computer’s brain. “What day is it?” SUNDAY, it said. “Oh yes. What are the first three letters of the alphabet?” ABC, it said. “Quite right, now you are working.” YES, it said. “Oh dear, it’s answering everything. I KNOW I AM. 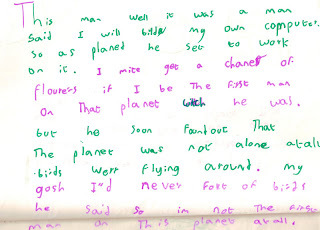 “Calling planet…” EARTH. 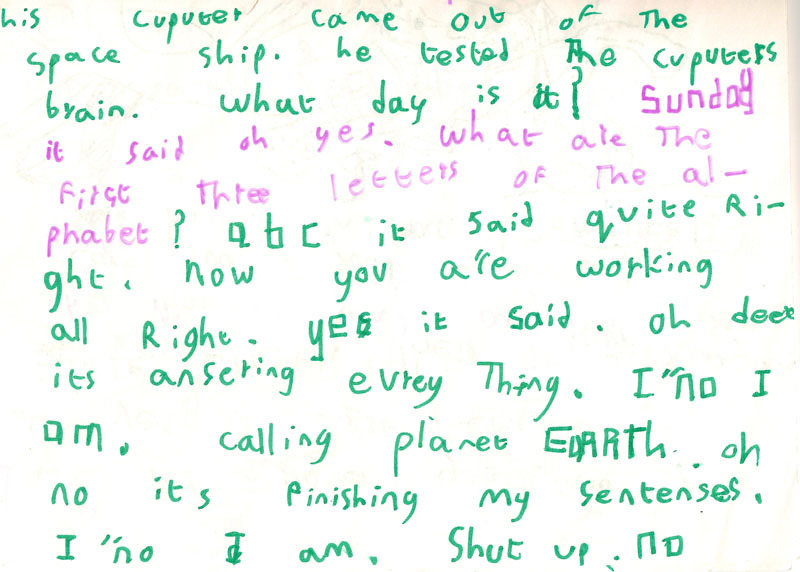 “Oh no, it’s finishing my sentences”. I KNOW I AM. “Shut up!” NO. 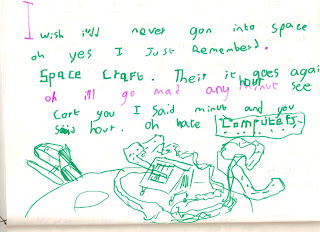 “I wish I’d never gone into space. 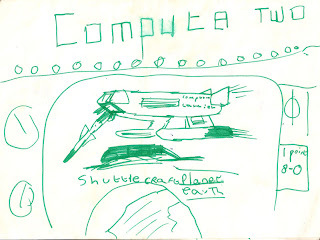 Oh yes, I just remembered.” SPACE CRAFT. “There it goes again, oh, I’ll go mad any minute.” HOUR. “See [can’t] you, I said minute and you said hour. 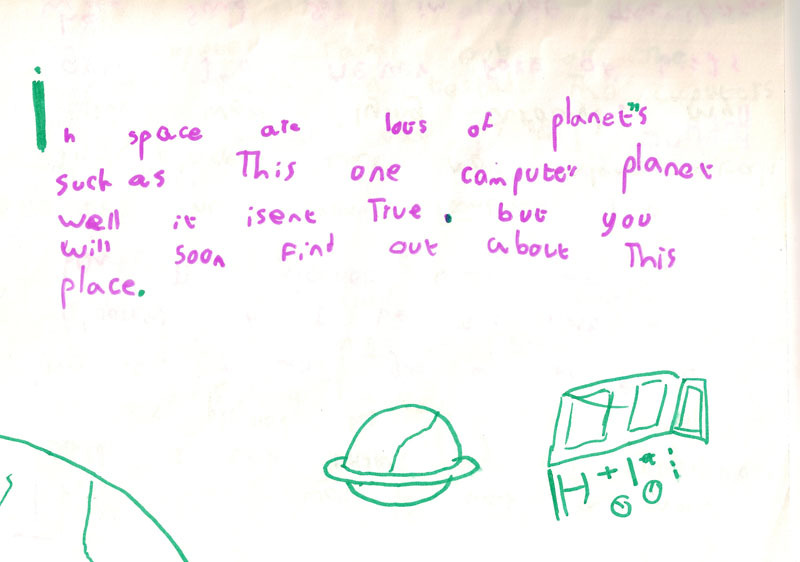 Oh, hate computers. " As a side not Mr. Reynolds, this rocks. I am totally going to print this out and add it as a tip-in to the Deep Navigation collection. I cannot wait for the conclusion! Superb job there, Tim! I don't know what the [chanel] is either. Was this story inspired by Dear Enemy's one and only hit "Computer One"? I believe it's a 'chain' of flowers, as in the Sugarcubes 'Birthday'. PS loved Terminal World, now immediately re-reading it. Any plans for a sequel? Phillip: I wondered if it was "chance of flowers" myself but chain fits equally well. Awesome story Al, and very cool that you still have it after close to forty years. Hopefully this means your scanner is up and running and you can send that poor, irritating sod that picture of a certain spacecraft? By the way, research into production is proceeding nicely and I'm currently looking into some different programs to render it in 3D. Anyhow, I'll update better by e-mail later. This is awesome! And thank you for sharing it with us!!! 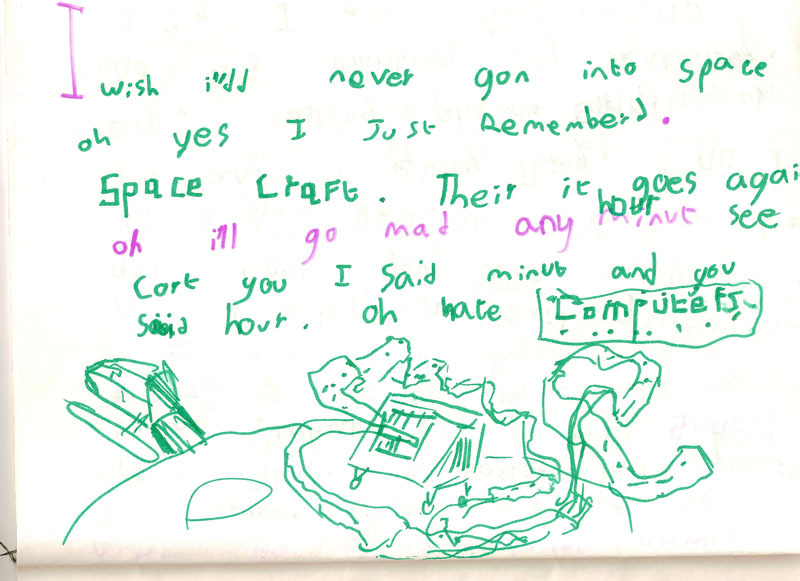 This is lovely, I can remember spending my childhood filling pads of paper with my felt tip space operas! I don't know what happened to them, probably in the loft or in a landfill now.You're a lucky man to still have these little momentos from childhood. Hello there. Nothing to say on this particular topic but I am wondering if The Six Directions of Space will ever be reprinted. No offense but $191 U.S. used on Abebooks is a tad out of my price range. Off topic: I've only just discovered your writing, and am thoroughly enjoying it (have read Revalation Space trilogy and Galactic North, and am starting on Chasm City). But I was disappointed that your description of what the stars look like at relatavistic speeds is inaccurate. It's a minor thing, but mildy annoying to a scientist like myself. The starts do not bunch up both in front and behind, they only bunch up in front. Behind, they spread out, and fade to black due to the doppler shift. Eventually all you see is a bright circle/spot of stars in your forward field of view, with the boundaries of this circle representing 'level with the observer' (anything behind you has faded to black by that stage). If any other readers are interested, I would recommend a piece of shareware astronomical software called "Starstrider" - it simulates both the abberation and doppler shift experienced by a relativistic observer. You can also get 6 Directions of Space in the anthology "Galactic Empires" by Gardner Dozois. You can buy that on Amazon.com for less than a dollar.